Seems like everyone’s jumping on the HD bandwagon these days. Previously it was HTC and now it seems as if it’s Sony Ericsson’s turn. Not a lot is known about it at the moment except that it was originally a Japanese only variant which was then later changed to global one. The Android smartphone is called Nozomi but I suppose for the rest of the world it would have a more ‘global’ name. It will have a 4.3” screen with 1280×720 screen which is essentially 720p for movie buffs. 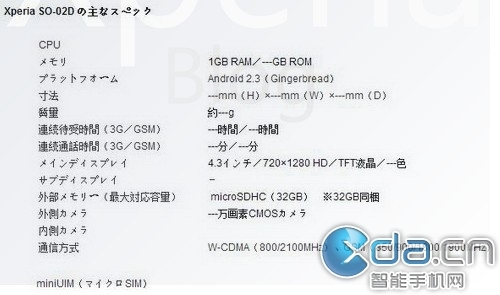 It will run the latest version of Android Gingerbread and will come with 1GB of RAM. CPU tasks will be taken care of by a 1.4Ghz single-core processor which sticks out sorely from the rest of the specs considering all flagship phones now have a dual core CPU. No word on the release date for now.